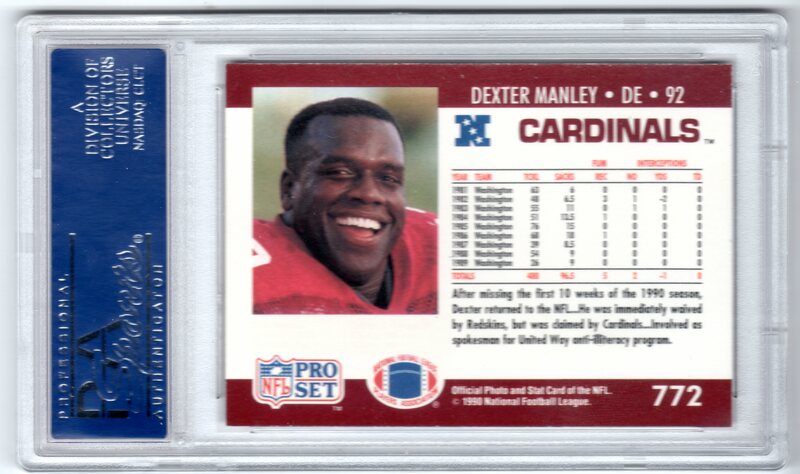 Not much is known about this card, in fact, I’ve yet to hear any mention of it since it was posted in the legendary Frank Thomas NNOF thread on the Collectors Universe boards. Pulled from a 20-set case of 1990 Topps Debut ’89 sets. 1990 Topps Debut ’89 features 152 subjects. 152 subjects doesn’t work with Topps’ multiples of 11 sheet orientation, however, 154 does. This leads me to believe that on a single uncut 154 card sheet, you will find all 152 cards plus two of these “corner” cards. Obviously, the same formula can be applied to a theoretical 77 card sheet, but one X card per. I believe that these cards were intended to be thrown out as printer’s waste but some, apparently very few, made their way into sets. I do not believe that the X cards were intended to depict a player. Although I did not do the research, Topps claims that this set features every major league debut of the 1989 season, which would explain it’s unusual subject number (152) , which varied each of the subsequent years lending some truth to the claim. What’s especially odd is that given Topps’ high production run during this era, those two “wasted” spots would seem like something of loss financially. Given how often Topps put advertisements and offer cards in products, why didn’t they use those spots for something useful? Food for thought. Obviously, all of this could be simply explained with an image of an uncut sheet but until I get a hold of one, where’s the fun in that? To say April 2011 was a good stretch for me, Pro Set-wise, would be an understatement. Not quite sure what is going on with this card but it looks like a handwritten P. except that it is definitely printed on the card. Similar to the 1978 Topps Bump Wills with black circle, in person, it looks like a proofer took a marker or sharpie to a plate or a negative and made a note in the form of ‘P.’ A search through nearly a hundred other copies did not produce another! While examining the Craig cards from my break, I noticed that they all had a slanted top stat line on back, so I dug into my inventory of Pro Set commons and pulled out all my Craigs. Immediately I caught a copy that had what appeared to be blood stains on his leg on front, very likely that they are printing flaws, but since they so strongly resemble that, and how appropriate that is considering the sport, I decided the moniker fits best. A search through the remaining (almost a hundred) copies turned up four more. I usually visit this shop every couple of weeks and scoop up their junk boxes, typical late 80s to early 90s stuff and a great source of the bulk of my 1990 Pro Set inventory, not to mention, a slew of unmarked promos and other oddball goodies. On this trip, they had several 800ct boxes for $1 each, some including a bunch of 1990 Pro Set commons, a stack of mixed 3200ct and 5000ct boxes at $5 a piece – I grabbed them all. Interestingly enough, Dexter was just one of three final update subjects (Fred Washington and Brad Baxter were the others) among mostly series one and two commons found in this lot. The funny thing too, is that I didn’t even notice the bio area immediately, hoping for a long shot chance at a “substance abuse” variation. I reviewed the card over and over and finally decided to add it into my PSA submission, unfortunately, they do not recognize the variety on the label but still graded it an NM-MT 8. Not bad, really! One other interesting note: Like the John Fourcade stats variation, if you squint hard enough, it almost looks as if the presses did go down over the bio area and faintly printed the info in a yellowish color. It really is tough to see, so until a better description pops up, “No Bio” works for me. As usual, it’s safe to say that this is not the end of new Pro Set variation discoveries, but it was a great month full of cool finds allover, from this to the recent sales of the scarce Jeff George Gold promos on ebay, to the flood of interest in the 1990 set that I’ve been picking up on across message boards. Great to see so much happening with such a complex and fun set! 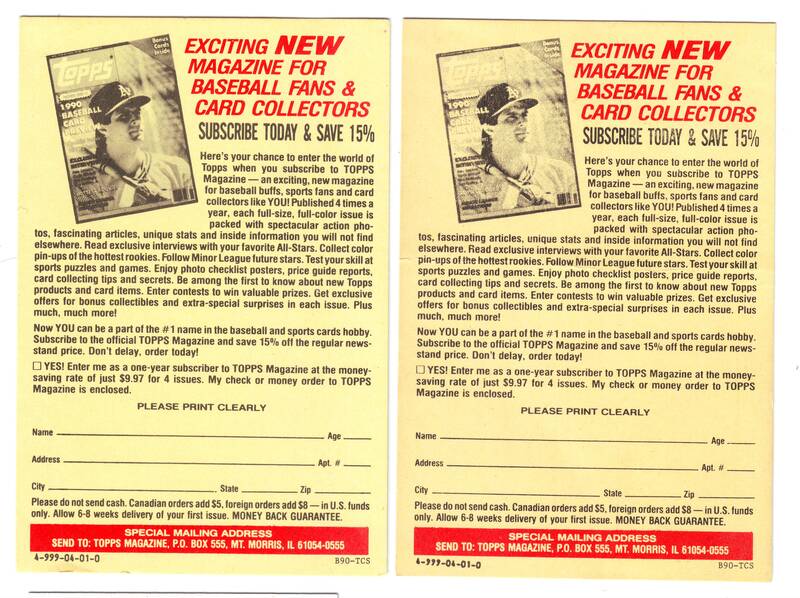 Another product of my 1990 Topps research that I found fascinating was the enormous amount of “offer” or “ad” cards that Topps packed into their products. Every pack got a “Spring Training Fever” sweepstakes card or a offer for one of many different Topps clothing items, sometimes an offer for cards, sheets or a binder instead. But 1990 also marked the debut of Topps’ quarterly magazine and the company chose A’s slugger Jose Canseco as the face of it’s promotion as well as the cover subject for the first issue. The type on the left, with the larger print, printed horizontally, seems to be the “common” type as I pulled 9 of them out of 11 sets. The remaining two were of the smaller print, diagonally-printed type shown at right. 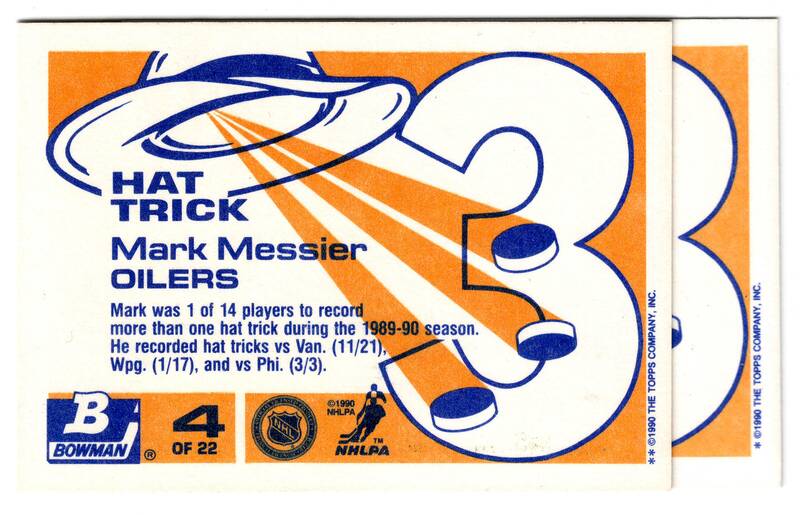 A little-known variety exist on 90-91 Bowman NHL Hat Tricks subset cards. Each of the 22 subject comes in two varieties: Single asterisk * before copyright on back or Double asterisk * * before copyright on back. Some versions are tougher than others depending on the player. Building a master set can be a real challenge! 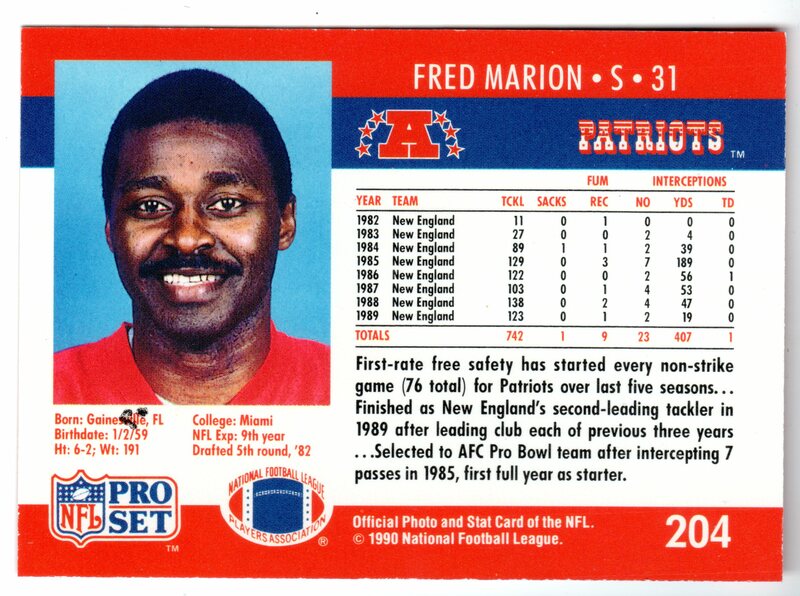 Did you know that the 1990 Topps Football Master Set has over 1200 cards to it? Each of the 528 cards comes either with or without an “unlicensed disclaimer” on back. That’s 1056 cards right there. Then each of the 30 1000 Yard Club Cards have those variations. Plus an asterisk variation for each. That’s 120 more cards. Freshly discovered is yet another variation in the 1990 set, card #498 Checklist 1-132. One version has a gap in the border just before it touches the “hashmarks” at bottom-right on front. A handful of other cards also contain some pretty noticeable variations: All of the Record Breakers subset cards have letter-code variations, Al Baker’s card has a logo color variation, Bruce Hill’s card has a similar border variation to this one. 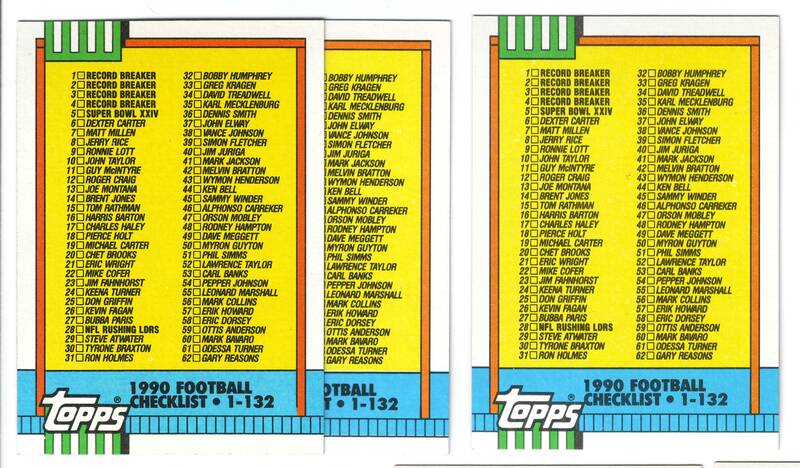 The master checklist on 1990 Topps Football is growing – which makes it one of the most challenging sets to build for the variation collector. 1991 Score is one of those set that hasn’t been paid enough attention to, in regards to error-hunting. Ive never really liked the set and I know that I’ve neglected my duty in sorting through bulk batches of it in effort to discover something new. One of the latest (ca. 2005-2006) discoveries from this set affect Bo Jackson’s card #420, from the Highlights subset. 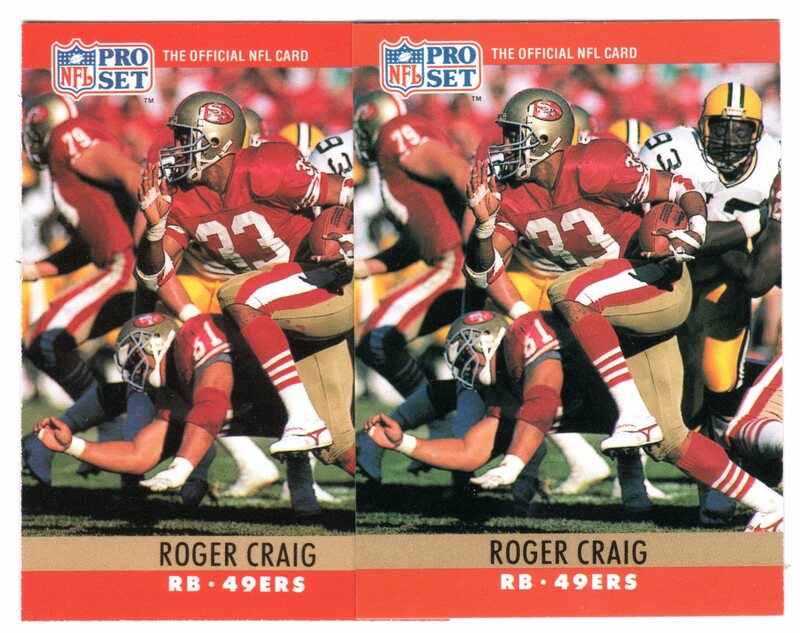 Early versions of the card have the ’90 on front, printed in a very light blue color. 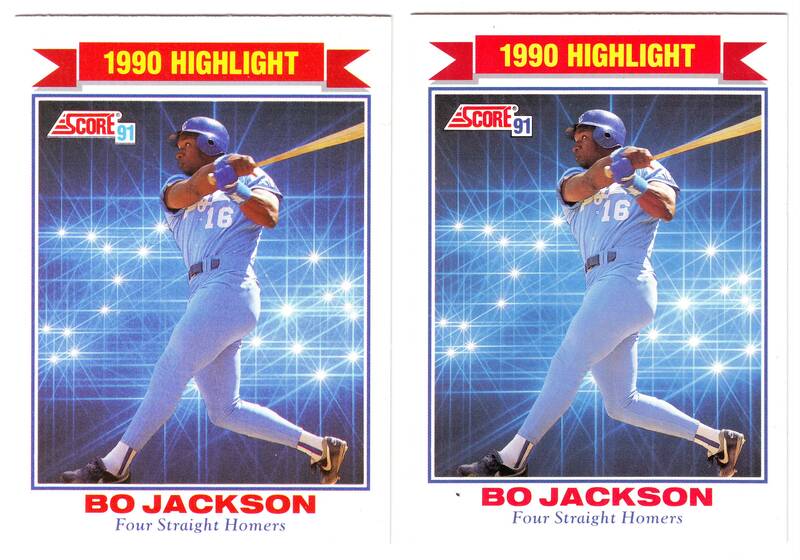 Later releases corrected it by printing the ’90 in dark blue just like the other cards in the set. 1990 Topps Traded Baseball was released for a short time in wax packs/boxes, only at retail locations. One of the main differences between this version and the boxed versions, is the card stock that Topps used. Like many other Topps Traded sets, the boxes version cards were printed on the bright, white card stock. 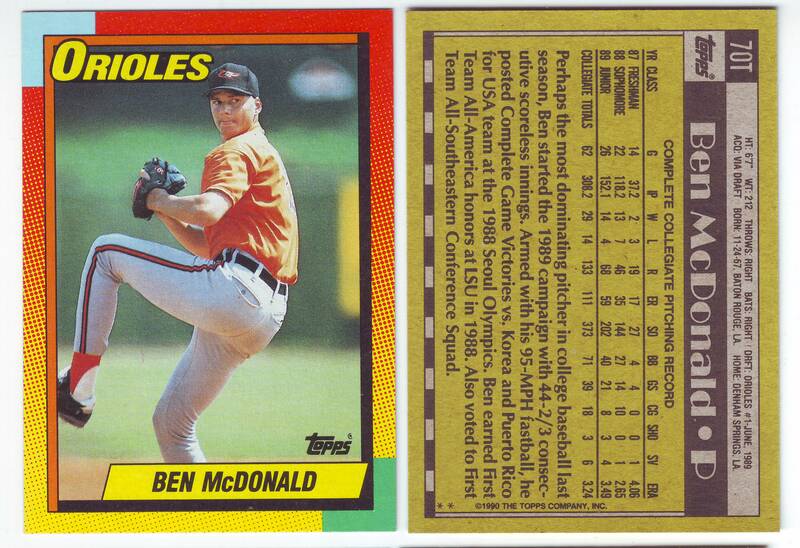 1990 Topps Traded wax issued cards were printed on the regular, old, card board stock that Topps had been printing it’s base cards on for ages. Each card found in wax packs of 1990 Topps Traded can be found in two different varieties: One, with a single asterisk * before the copyright line on back. And two, with double asterisks * * before the copyright line on back. For those keeping score at home, that brings the grand total of 1990 Topps Traded cards included in a master set, to 396! And if you count the Tiffany edition, 528 total cards!! That’s a lot of variations for an update set! Oh, and dont forget to wash, rinse and repeat for the 1991 Topps Traded set.